I’m just a little bit clumsy. I’ve fallen into a parked car, giving myself a concussion in the process. I’ve dislocated my toe on the Tongariro Crossing, having to hobble the final 2km so I could catch my bus. 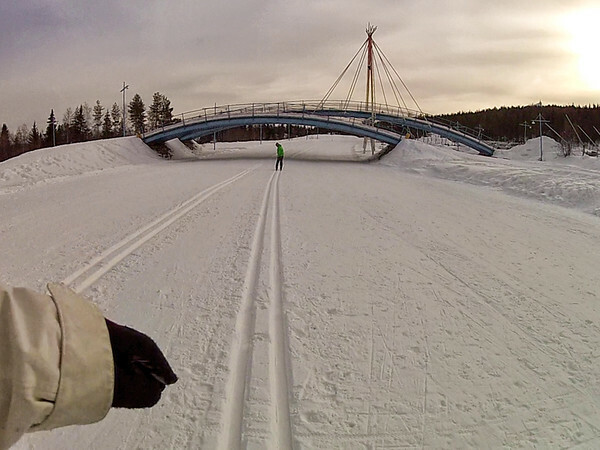 Last year, I planned to try cross-country skiing, only to break my leg before I got the chance. 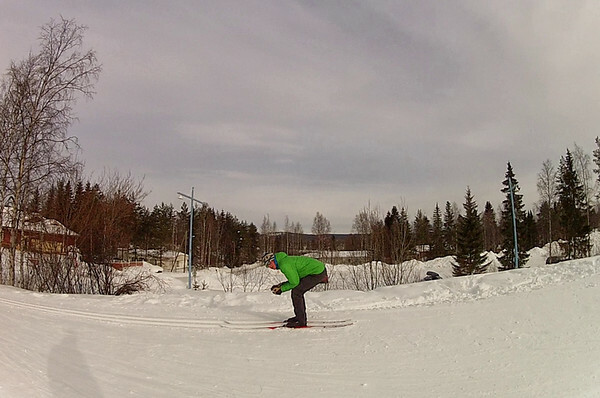 Attempting to clip in to my skis…and failing. I didn’t think any of this boded well for my attempt at cross-country skiing this year. I knew I’d been able to stand up and (somewhat) successfully snowboard in both Japan and Finland, but the prospect of my feet going in two very different directions once attached to skis seemed to be a very real possibility. Fortunately, I was going to be learning from the best: a Finn. Almost as soon as they learn their ABCs, Finnish children have a pair of skis strapped to their feet and are sent on their way. It’s more than just a way to torture kids in gym class — it’s a crucial skill to have in a land where snow can be on the ground for more than six months a year. An early attempt at skiing in the tracks without any ski poles. 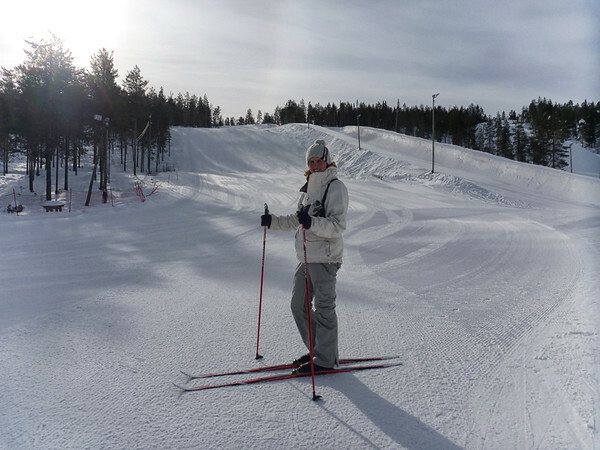 The lucky Finn that got the task of trying to keep me on my feet during my lesson at Rovaniemi’s Ounasvaara ski area was named Riku. Luckily, he was incredibly patient…and he even managed to keep a straight face as I bumbled around, unable to even clip my boot into a ski. 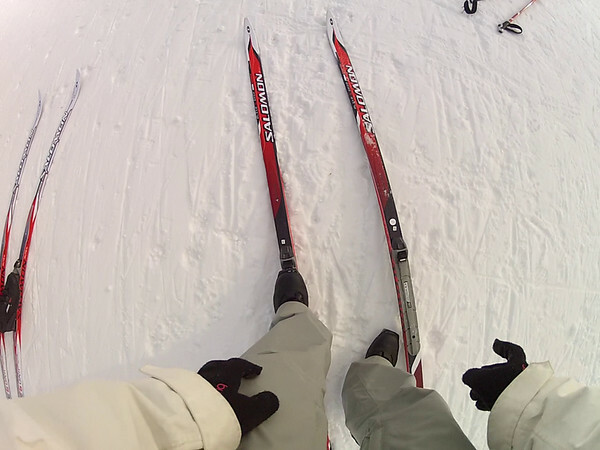 Once I’d finally done that, he walked me through a few basic movements to help try to get me used to the skis. 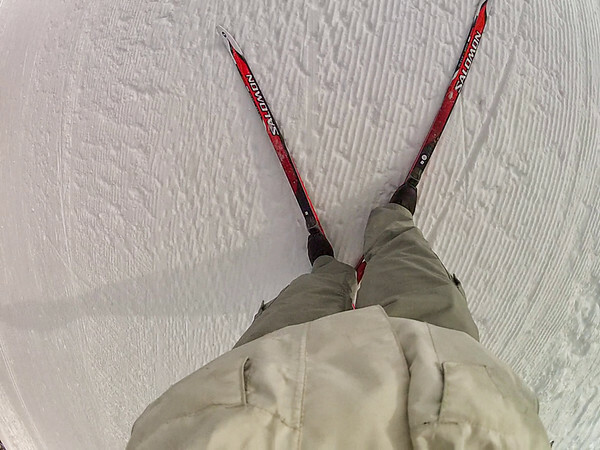 Even with one foot on (sort of) solid ground, I could feel the ski slipping around. I eventually started to get the hang of how you might slide along on it — which was, as Riku pointed out, the main difference between skiing and just walking. Then it was on to two skis. It seemed counter-intuitive when Riku said I should leave my ski poles behind when I started; what would I have to catch when I started to fall? I did what he said though, and skis in tracks, aiming downhill, I started trying to lengthen each stride. I wobbled a lot and was soon overtaken by a 5-year-old on a parallel track, but I made Riku proud and didn’t fall. We repeated the process a few times and I got steadily faster and better at ignoring fearless five-year-olds flying past. Oh, to have grown up in snow. Either I would be an expert skier by now or I would have had several joint replacements by the age of 28. The world will never know. Riku demonstrating the proper technique for going downhill. When Riku thought I was ready, we moved on to the little bridge over the beginner tracks. At the top, he demonstrated the technique for going downhill. (It looked suspiciously like crouching and praying you make it to the bottom alive!) All I needed to do was crouch as low as I could manage and make sure I never put my poles out to stop myself. When I asked how I would stop, Riku said I would naturally slow down at the bottom. I hoped he was right! What a rush it was, even on a small hill. I quickly gained more speed than I’d ever allowed myself on a snowboard, and the ski tracks ensured it was all directed in a straight line. I smiled into the rush of air as the hill came to an end, only to quickly have it wiped off my face by the fact that I now had to climb back up the hill to try again. Riku was very encouraging as I feebly tried to form a V-shape with my skis so I didn’t just slide back to where I started with each step. Instead, I only slid back about halfway each time, which meant that, even though it took me about 10x longer than Riku, I eventually made it to the top. It wasn’t long before he declared me ready for a real track, and I unclipped my skis and walked to the trailhead with significantly less trepidation than I had faced on my first trip down the slopes on a snowboard. I was actually looking forward to it and even feeling somewhat confident in my own (slow but steady) abilities (and very confident in Riku’s ability to help me if I did something silly). 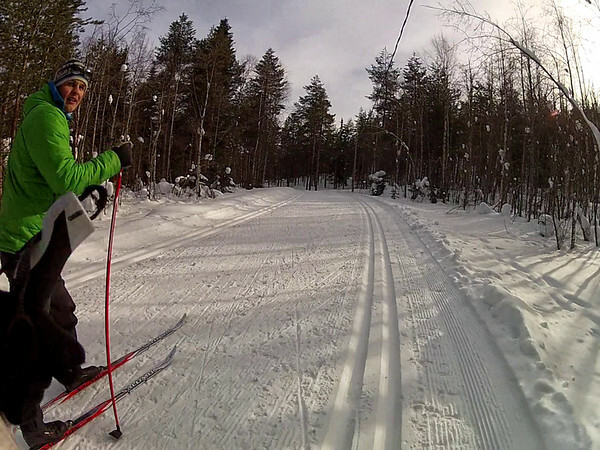 Skis in tracks, I got up some momentum on the first downhill and tried to keep it going for the treks uphill. I had a blast slipping along through the forest, so far away from the hustle and bustle of the city even though it was just across the river. And, even though those Finnish children would have still passed me had they been on this track, I felt fairly comfortable with the speed I was going and my ability to stay upright — so much so that, when we turned around after a climb and Riku asked how I felt going down the steepest downhill on the track, I was keen to give it a go. He was almost as excited as I was when I got to the bottom on a serious adrenaline rush. I’d made it and I’d gone fast! Riku’s surprised that I’m still on my feet. I was still realistic though. When Riku asked if I wanted to try going up and over a bridge that would take us back to the ski rentals hut, I chose to take off my skis and walk instead. The bridge looked very steep and wiping out on it was not how I envisioned finishing what was otherwise a successful attempt at skiing. I think he breathed a sigh of relief at that one too. Happily posing at the end of my lesson. No, that’s not the big hill I went down. That would have been terrifying. I’m very happy I chose to have a lesson rather than trying to ski on my own for the first time; with some good pointers and a lot of encouragement, Riku turned something that could have been disastrous into a very fun experience — and I didn’t even fall over once! 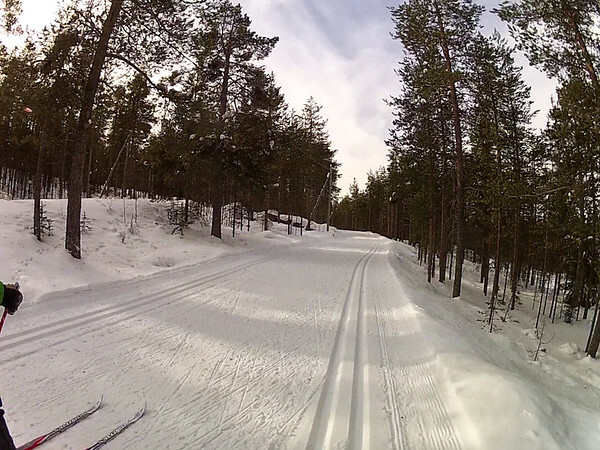 I went cross-country skiing at Ounasvaara as a guest of Visit Rovaniemi and Visit Finland, but all opinions stated here are my own. A 90-minute private lesson like mine costs €89.